Ah, the hit factory that was Stock Aitken Waterman strikes again. Infamous for churning out manufactured bubblegum pop, that were often pre-written and recorded songs that they plugged a singer into rather than taking into account of the talent they had before they started. However, their music filled the charts and the club dance-floors and gave us some great future talents like Princess, Mandy Smith, Sinitta, Kylie Minogue. 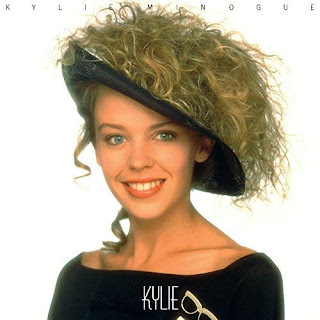 Yes, Kylie was one of the few that broke out of the mould of the PWL factory and managed to maintain a chart topping career for these past thirty years but this album, Kylie, was where the whole music thing started for her. And, true to PWL form, this album is just hit after hit after hit after hit. I Should Be So Lucky is, of course, on there (apparently written in 40 minutes by Mike Stock while Kylie was waiting to record it because they had forgotten she was coming to the studio) as is the Little Eva cover, The Loco-Motion. We also have the singles Got To Be Certain, It’s No Secret, Turn It Into Love and Je Ne Sais Pas Pourquoi which you would definitely know if you heard them. So far, so poppy. Other than that, we have another four tracks with I Miss You being a Motown rip-off with added drum machine, I’ll Still Be Loving You as a slowed down version with some weird attempts at guitar noises, Love at First Sight sounding like all the rest of the songs but speeded up a bit with even more drum machine added and only Look My Way actually managed to sound like the early 80’s Madonna-esque track it feels like they were going for. So, thirty years on, no the album doesn’t hold up, it’s frankly painful to listen to for the most part as it’s all regurgitated sugary happy clappy stuff but, in its time, it was a mega-hit and it lit the flame of the Kylie mega-star that has lighted our way ever since so for that we can be thankful. Oh, and if you hoped I wouldn’t bother adding a Kylie track to the end of the review… aye, right. You should be so lucky!